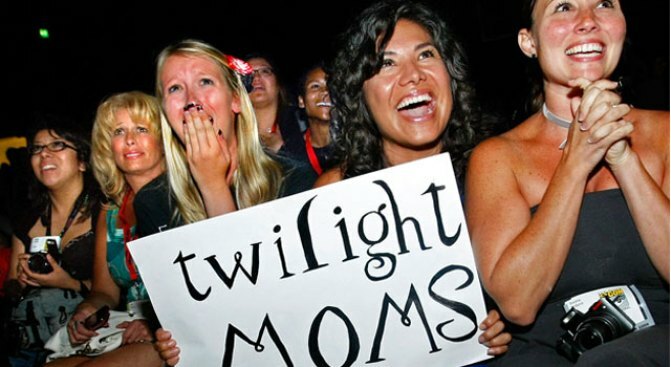 Fans lined up in the Gaslamp to see the stars of the hit movie "Twilight"
Fans young and old lined up for "The Twilight Saga: New Moon" event at Comic Con. Chants and screams from frenzied fans of the movie rocked San Diego's Gaslamp Thursday night as the stars of the film - Kristen Stewart, Taylor Lautner and Robert Pattinson - appeared for a special screening. The trio, in town to promote the upcoming release "The Twilight Saga: New Moon," stood for a group picture with the cast from the original movie and smiled at a special screening at the Pacific Gaslamp. Inside the convention, Stewart, Lautner and Pattinson answered questions and gave fans their first look at never-before-seen footage of the sequel. When asked what had changed since their visit to Comic-Con last year, the stars looked at each other and smiled. Pattinson admitted he walks with his head down a little more often than he used to. Lautner talked about his schedule getting busier with new projects and promotional tours. While Stewart was pretty straight to the point, "I cut all my hair off," she said referencing her new look for her role as Joan Jett in an upcoming movie. At night, the stars appeared briefly as a group to the delight of their die-hard fans. "All my dreams are coming true," said one young fan. "I saw his beautiful tan skin and went crazy, him and his sunglasses and it was breathtaking," one fan said about Pattinson. Thousands wearing their red lanyards and passes filled the San Diego Convention Center Thursday for the first day of Comic-Con 2009. The annual celebration of all things pop culture is known for its big-name celebrities and die-hard fans who dress as their favorite heroes (or villains). Even on the first day, the celeb sightings were fast and furious. Johnny Depp made a surprise appearance during the Disney Animation Panel in Hall H on Thursday. Depp, along with director Tim Burton, showed a clip from the March release of "Alice in Wonderland." Other highlights include the convention's first 3D screening, Peter Jackson's first Comic-Con appearance, the annual address by Kevin Smith and of course updates on some of the hottest shows. "Heroes," "The Big Bang Theory," "24" and just about every hit on Nickelodeon will be present this weekend.